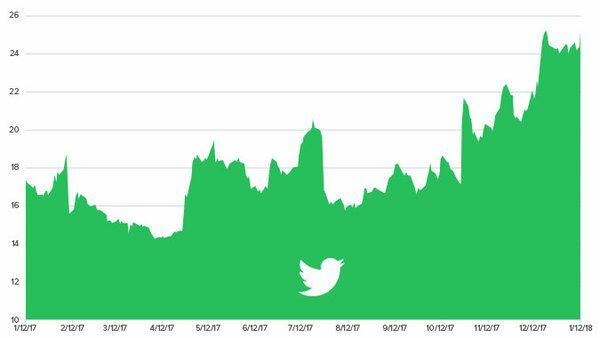 Editor's Note: We added Twitter (TWTR) to Investing Ideas on December 27, 2017. Shares have risen approximately 88% since (compared to a 3.5% return for S&P 500). Below is the brief stock report we emailed to our subscribers. For more information on Investing Ideas and how you can sign up click here. We presented our long call on Twitter (TWTR) recently. We viewed the series of events that ultimately led TWTR to restructure as the result of self-inflicted wounds on the part of an unsustainable monetization strategy (i.e. excessive ad load). 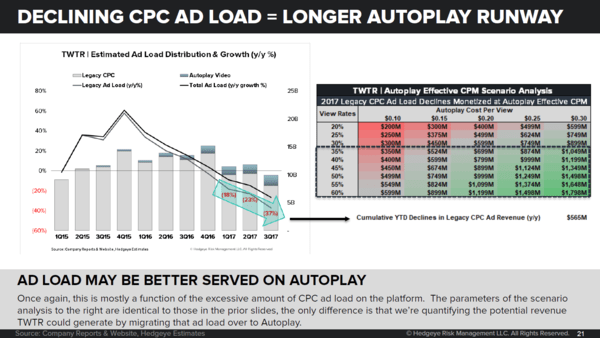 However, we now believe management’s pivot to de-emphasizing legacy CPC ads in favor of Autoplay video ads is a more sustainable long-term growth strategy. Further, we don’t think it will take much to return to double-digit ad revenue growth in 2018, possibly as soon as 1H18, as the Olympics, World Cup, and mid-term elections are all positive catalysts for ad spend. Between 2014 and 2016, Twitter’s prior monetization had two growth drivers that were working against each other (user growth & ad load), and the model failed in 2Q16. 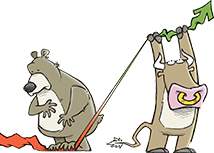 TWTR has since used the restructuring to right-size its model in terms of ad load while also prioritizing Autoplay, which reduces its dependence on ad load and takes pressure off its MAU growth. Pre-restructuring, the issues were mostly a function of the excessive amount of CPC ad load on the platform. As you can see in the charts below we’re quantifying the potential revenue TWTR could generate by migrating ad load over to Autoplay. We’re not trying to emphasize TWTR’s potential Autoplay revenue growth as much as waning impact that Legacy CPC will have on the model now that it’s a smaller portion of the pie. On that front, we estimate that Legacy CPC has declined to roughly half of TWTR’s Owned & Operated Ad revenue, so even if it were to decline at comparable rates it would have less of impact on the model moving forward simply because it’s a smaller portion of the total pie. But it looks like Legacy CPC revenues have started to stabilize sequentially, so it may not be as much of an issue into 2018. We suspect TWTR could return to double-digit ad revenue growth by as early as 1H18. The Olympics and World Cup were a big driver for 1H14 results. We’re not expecting comparable growth since TWTR was a much smaller company back then. But if TWTR can reproduce comparable absolute revenues from these events, it would translate to an extra 2% and 5% growth to 1Q18 and 2Q18 results, respectively; not a tall order considering its user base is ~30% larger now. Further, after vetting what we had previously viewed as the two biggest risks to the story (users and advertiser demand), we now feel more comfortable heading into 2018 given the collective growth driver between the two. We see 25%+ upside from current levels.